American lunar logistics spacecraft. Cancelled 1968. The LM Truck was an LM Descent stage adapted for unmanned delivery of payloads of up to 5,000 kg to the lunar surface in support of a lunar base using Apollo technology. AKA: LM Truck. Status: Cancelled 1968. Thrust: 44.04 kN (9,901 lbf). Gross mass: 8,990 kg (19,810 lb). Unfuelled mass: 1,570 kg (3,460 lb). Specific impulse: 311 s. Height: 3.20 m (10.40 ft). The LM Truck would make precision landings using radio landing beacons prepositioned by the lunar base staff. The Truck could be accompanied by an Apollo CSM on a purely lunar orbital mission. Alternatively two Trucks could be delivered in a single unmanned Saturn V mission, with a partially-fueled Apollo Service Module being used for the lunar orbit insertion maneuver. Items added to the basic descent stage: Navigation and guidance system (126 kg); stability and control system (49 kg); reaction control system (250 kg); communications (21 kg); ECS for equipment (58 kg). The LM Truck concept used a modified LM descent stage as a Lunar Logistic Vehicle. The LM ascent stage was removed and replaced by a cargo platform. Subsystems now on the LM ascent stages necessary for landing (e.g., reaction control system (RCS) and guidance) were added. The basic flight plan assumed a manned Command Service Module (CSM), Lunar Orbit Rendezvous (LOR) mode. The LM Truck would be landed by remote control from the manned CSM, which would then return to earth. The crew that would actually unload the Truck would arrive months later in a separate CSM, and ride an LM Taxi to a surface rendezvous with the Truck. However, a totally unmanned flight mode was possible with proper guidance and navigation modification. As conceived, the LM Truck weighed 10,000 kg and had the same propellant capacity and payload capability as the LM descent stage. The LM Truck capability would benefit from an "augmented" LM development. 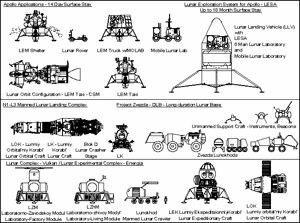 Family: Lunar Landers, Lunar logistics spacecraft, Moon. Country: USA. Spacecraft: ALSS Lunar Base. Launch Vehicles: Saturn V. Propellants: N2O4/Aerozine-50. Agency: Grumman. Bibliography: 200, 201, 202, 203, 204, 26. Comparison of American post-Apollo lunar spacecraft. Apollo Logistic Support System Office investigates extensions of Apollo hardware. - . Nation: USA. Spacecraft Bus: Apollo LM. Spacecraft: Apollo LM Truck. The recent creation of the Apollo Logistic Support System Office in Washington prompted the formal investigation of a variety of extensions of Apollo hardware to achieve greater scientific and exploratory dividends from Apollo hardware. Director of Special Manned Space Flight Studies William B. Taylor suggested to William E. Stoney and others in Houston that Grumman receive a study contract to investigate possible modifications to the lunar excursion module (LEM) to create a LEM truck (concepts which the company had already investigated preliminarily on an in-house basis). The time was appropriate, Taylor said, for more intensive and formal efforts along these lines. Grumman final report on a study of LEM utilization for AES Earth-orbit missions. - . Nation: USA. Spacecraft: Apollo LM Lab, Apollo LM Shelter, Apollo LM Taxi, Apollo LM Truck. 1966 December 1 - . 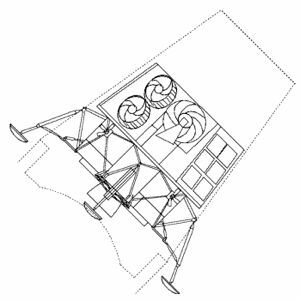 Modified lunar modules for a lunar exploration program - . Nation: USA. 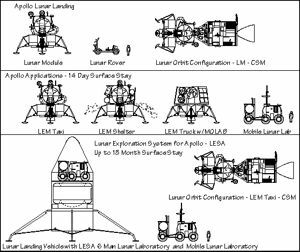 Spacecraft: Apollo LM Shelter, Apollo LM Taxi, Apollo LM Truck, Apollo X.
John H. Disher released the report by a study group at Headquarters on various modified lunar modules suitable for a lunar exploration program as part of AAP. These modified craft took the form of a LM taxi, ferry and logistics craft, a LM shelter, and an 'augmented' LM. Disher authorized MSC to extend its engineering studies contract with Grumman to further define such modified LM configurations. He also asked MSFC to try to increase the Saturn V's translunar injection capability to 46 720 kg. These actions, he explained, afforded an opportunity to pursue any of several alternatives once future landing levels were known. NASA lunar exploration program developed for the period from the first lunar landing to the mid-1970s. - . Nation: USA. Spacecraft: Apollo ATM, Apollo LM Taxi, Apollo LM Truck, Apollo LMSS, Skylab. NASA lunar exploration program developed for the period from the first lunar landing to the mid-1970s. A lunar exploration program had been developed which would cover the period from the first lunar landing to the mid-1970s. The program would be divided into four phases: (1) An Apollo phase employing Apollo hardware. (2) A lunar exploration phase untilizing an extended LM with increased landed payload weight and staytime capability. (3) A lunar orbital survey and exploration phase using the AAP-1A carrier or the LM/ATM to mount remote sensors and photographic equipment on a manned polar orbit mission. 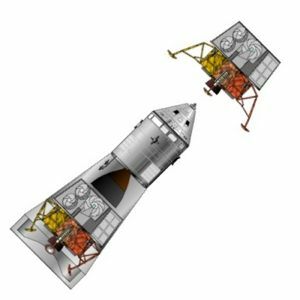 (4) A lunar surface rendezvous and exploration phase which would use a modified LM in an unmanned landing to provide increased scientific payload and expendables necessary to extend an accompanying manned LM mission to two weeks duration.